The background and story of David and the hyssop plant are related in 2 Samuel chapters 11:1–12:25 and Psalm 51 (New International Version Study Bible, 2002). In the spring David remained in Jerusalem when the Israelite army went out to fight the Ammonites. Unable to sleep one evening, David walked on the palace roof. Looking down he saw a beautiful woman, Bathsheba, bathing. David had Bathsheba brought to him and they spent the night together. Later Bathsheba sent David a note saying she was pregnant. The problem was that Bathsheba was the wife of Uriah, a soldier serving with the Israelite army. God’s law prescribed the death penalty for both David and Bathsheba because of their adultery (Leviticus 20:10). Attempting to cover his transgression, David ordered Bathsheba’s husband to be placed in the front lines of battle without adequate support. Uriah was killed. After Bathsheba’s mourning period, David married Bathsheba. Chapter 11 ends with the statement, “the thing that David had done displeased the Lord” (2 Samuel 11:27). 1) Because David killed Uriah with the sword of the Ammonites and took Bathsheba as a wife, the sword would never depart from David’s house. 2) Calamity will come on David from his own household and his wives would be given to one who is close to David. David’s immediate response was to acknowledge his sin before Nathan and before God. Nathan assured David that God took his sin away and that David would not die; but, David and Bathsheba’s child would die. Psalm 51 was written by David soon after Nathan confronted him with his adultery and murder. Psalm 51 is classified as one of the Penitential Psalms. David began the Psalm asking God for mercy and to wash away his sins. Specifically, David asked God to cleanse him with hyssop. The hyssop plant was used in the first Passover in Egypt to mark Israelite homes with the blood of the Passover lamb or goat (Exodus 12:21-23). It was also used by them in ritual cleansing or purification, e.g., after an individual recovered from a skin infection (Leviticus 14:3-7) and after a home was cleaned from mildew (Leviticus 14:48-53). The hairy surface of hyssop leaves and branches held liquids well; thus, it was adopted as a sprinkling device in purification rituals. The hyssop that David referred to was most likely the aromatic plant Origanum syriacum called wild majoram, hyssop, and za`atar (Arabic). The hyssop is indigenous to Turkey and the eastern Mediterranean, e.g., Israel. In Israel, hyssop is distributed distributed throughout the country except the deserts. It is frost-sensitive. O. syriacum is an up-right perennial and a giant among oreganos growing as tall as four feet. 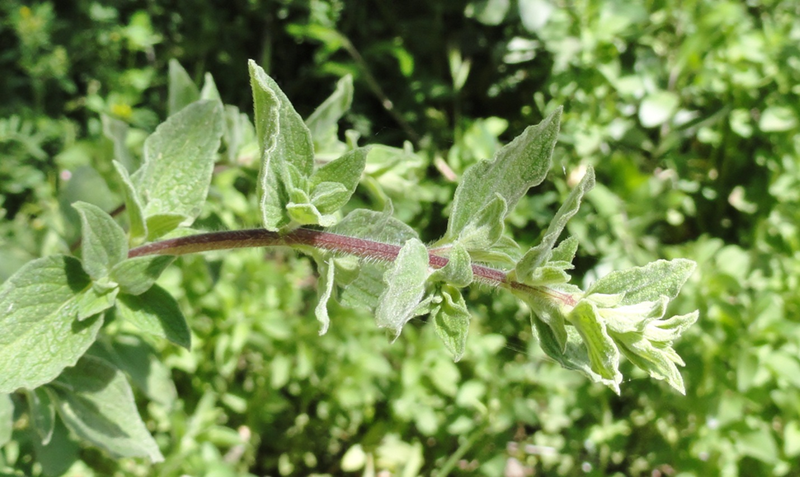 As the oregano plant ages, stems become a woody brown and leaves a dark, dusty green. The O. syriacum is harvested and used fresh when the plant is young until flowers bloom. Mature leaves and flowering stems are dried and sold commercially as “oregano,” a name that should be restricted to Origanum vulgare. The fresh or dried herb can be mixed with olive oil and spread over warm pita bread for a delicious accompaniment to a meal. Flower stems can be made into fresh herbal wreaths. As in ancient Israel, the O. syriacum was gathered in bunches and used as a brush or sprinkler for purification rituals. The hyssop plant is a symbol of humility. When David murdered Uriah and took Bathsheba as his wife, he mimicked the proud behavior of foreign kings; however, God called the Israelites to a higher standard of behavior (Leviticus 20:10). Murder was murder and adultery was adultery whether committed by the king or the lowest servant in Israel. When David cried out his remorse and asked to be cleansed with hyssop, he acknowledged his sin and repented. David showed his humility before God and before the people in his kingdom. Humility is a spirit of deference or submission, not being proud, haughty, arrogant, or assertive. Many Bible verses focus on humility. In the Old Testament we read that God guides the humble in what is right (Psalm 25:9), gives grace to the humble (Proverbs 3:34), and crowns the humble with salvation (Psalm 149:4). Humility takes precedence over both wisdom and honor (Proverbs 11:2, 15:33, 18:12). In the New Testament, humility is first mentioned in Matthew when Christ identified himself as gentle and humble in heart (Matthew 11:29). Paul told the Church at Philippi that Christ humbled himself and obeyed God, even though Christ’s obedience meant his death on the cross (Philippians2:8). As he was humble, Christ instructed us, his followers, to be humble (Matthew 18:4; Luke 14:7–11). Christ was concerned particularly about the humility of religious leaders. He noted that some Pharisees dressed in religious clothing, sat at places of honor at banquets, and loved to be called “Rabbi.” These Pharisees were more concerned with outward piety and praise than practicing their faith. Christ said “whoever exalts himself will be humbled and whoever humbles himself will be exalted” (Matthew 23:12, New International Version Study Bible, 2002). In this same instruction, Christ averred that the greatest among you will be your servant (Matthew 23:11). Recently, I attended a church dinner in a parishioner’s home. When I finished eating, I picked up my husband’s and my dishes and walked to the kitchen. At the sink I saw our senior pastor. He was alone in the kitchen washing dishes, in no way calling attention to him. As a fairly new member of the church, I began to realize why Pastor Mark was so loved. He exhibited humility and was willing to quietly serve others. For many of us, not acting haughty or arrogant is fairly easy. Haughty means blatantly or disdainfully proud; while arrogant is exaggerating our own worth or importance. We’ve seen individuals who are haughty and arrogant, and we don’t want to be like them. Not being assertive is harder. Asserting oneself is speaking or acting in a manner that compels recognition especially of one’s rights. Many individuals today, especially women, minorities, and students have taken courses on how to present themselves assertively. How do we reconcile the image of ourselves as being equals with not being assertive? The answer may be in the word compel in the definition of asserting oneself. To compel means to cause someone to do something because of overwhelming pressure. Christianity is not about compelling or forcing others to do what we want. Assertive, forcing, and compelling behaviors are antithetical to humility. You may be thinking that humility is all well and good for David; but, you are a minority in the work world or a student in a university. If you don’t demand, compel, or force your employer/teacher to acknowledge your rights, you will not have them. That could be true or it may not be true. Perhaps we could present our petitions and requests in non-forceful ways; in ways that distinguish us from non-Christian employees or students. I think about students who have disagreed with my grades and grading comments. When students communicate humbly, honestly questioning a grade, and asking for an explanation, I am much more prone to re-read their papers and re-thing the grade than when students’ communications are forceful and demanding. God does not always promise that Christians will achieve their every desire by acting humbly; yet Christians are called to be humble, to have a spirit of deference and submission. In his first letter Saint Peter wrote that we should clothe ourselves with humility toward one another because God opposes the proud but gives grace to the humble (1 Peter 5:5). Further, God instructed through Peter to “humble yourselves, therefore, under God’s mighty hand so that he may (is free to) lift you up in due time” (1 Peter 5:6). Notice that we must take the first step to reap God’s rewards. We must first be humble so we can receive God’s grace and be lifted up by God. Reflection. What would happen if for one week when you dressed every morning you imagined you were clothing yourself with humility? Try it and keep a daily journal of how your week goes. Think about the outcomes in relation to 1 Peter 5:5-6. This entry was posted in Plants & the Early Monarchy and tagged Bathsheba, Bible, Bible Garden, Bible Plant Symbolism: humility, Bible Plants, Bible Study, Christian walk, christianity, Garden, Gardener, God, God as a Gardener, humility, hyssop, Israelites, King David, nature, Origanum syriacum, plants, psalm 51, spirituality. Bookmark the permalink.